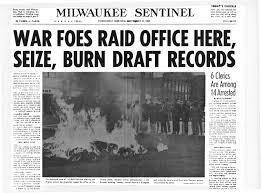 In the early evening of Sept. 24, 1968, 14 men — including five Catholic priests and a minister from the Church of Scientology — raided a federal office in downtown Milwaukee, took thousands of draft cards, carried them to a patch of grass across the street and set them on fire with homemade napalm. The Milwaukee 14, as the men behind the fire were to be known, set out to light a fire under the local debate over the Vietnam War. In 1968 the nation experienced a year of resistance and nonviolent direct action for civil rights and against the war in Vietnam. 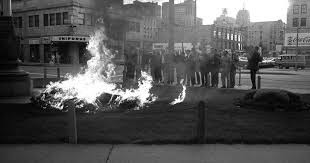 In Milwaukee, besides the burning of 1A draft records by the Milwaukee 14, open housing marches led to a fair housing ordinance and protests at Marquette University against “institutional racism” resulted in changes at the University. Also, ministry to those in need thrived at places like the Casa Maria Catholic Worker community. Fifty years later, we are engaged in some of the same struggles, and we are in need of this same moral courage. This celebration will remember the past but focus on how we can bring the spirit of 1968 and nonviolent direct action to today's national crises. We will gather at the at Central United Methodist Church, 639 North 25th Street in Milwaukee Friday night and all day Saturday. Events continue on Sunday and Monday. See Weekend Schedule. ©2018 by Mindset Design. Awesome Inc. theme. Powered by Blogger.